People mill about the Missouri Capitol building on Wednesday. The Missouri House and Senate traded a few bills Wednesday, including an amended one that would bring more specificity to a state ban on so-called "sanctuary cities." But nothing was sent to Gov. Eric Greitens all day. By a voice vote, the Missouri House approved an amendment to a broader land-acquisition bill that backers say is a tougher ban on “sanctuary cities’’ in the state and cuts off state money to any community that defies the ban. The same provision later got tacked on to another bill. Both need Senate approval. Lawmakers passed a bill in 2008 that banned sanctuary cities and then-Gov. Matt Blunt signed it into law. But backers of GOP Rep. Rick Brattin's amendment say this ban is tougher. Although St. Louis was not singled out by name, opponents said it was clear the ban was aimed at the city, since some officials — including new Mayor Lyda Krewson — have said they support making St. Louis friendly to immigrants. Sanctuary cities have no legal definition, but are communities that have pledged to protect unauthorized immigrants from prosecution. In late April, a federal judge blocked President Donald Trump’s executive order that would withhold federal funding from sanctuary cities. But Texas Gov. Greg Abbott signed into law this week a ban on sanctuary cities in his state, which asks police ask whether someone is in the U.S. illegally during routine stops. Brattin, a Republican from Harrisonville, said a ban was appropriate in order to go after unauthorized immigrants. “Federal statutes are there to ensure that our cities and municipalities are supposed to be engaged in this process to do away with those breaking law,” he said. But St. Louis Democratic Rep. Stacey Newman said the state has no role in the matter. “This is ugly, this is evil. This is clearly unconstitutional,’’ she said. Sen. Jamilah Nasheed, D-St. Louis, filibustered a bill taking direct aim at St. Louis’ new minimum wage for about two hours before it was tabled, putting the measure in jeopardy. Democratic Sen. Jamilah Nasheed of St. Louis filibusters a minimum wage ban on Wednesday. The measure would prevent communities from setting a rate higher than the state’s (currently $7.70 an hour), which is linked to inflation. St. Louis’ new minimum wage of $10 an hour went into effect Friday and will rise to $11 an hour next year. And Kansas City will vote in August on whether to raise its minimum wage to $13 an hour. St. Louis’ new ordinance had been held up in court since shortly after the Board of Aldermen approved it in 2015, but the state Supreme Court in February to tossed out a 1998 state ban barring municipalities from approving a minimum wage higher than the state’s — effectively, the bill that the legislature is considering. Supporters of the legislation say the market, not the government, should set the minimum wage, but Democrats say the bill would deny cities and counties the freedom to decide how much citizens should be paid. 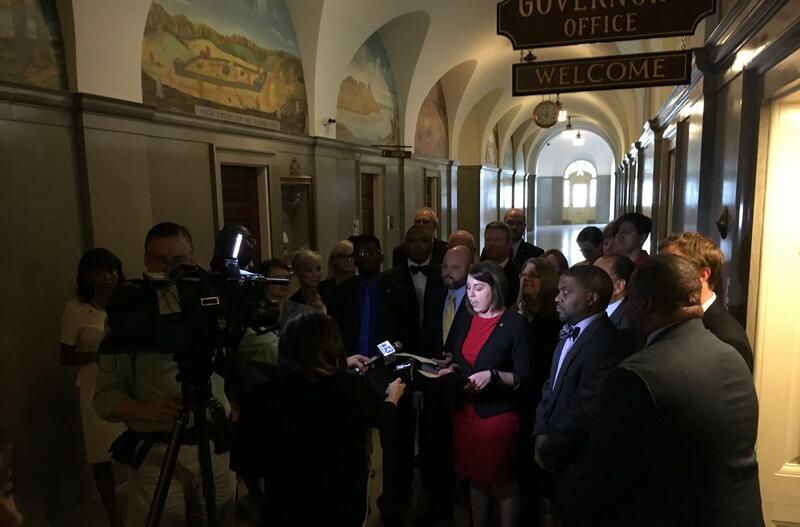 More than 20 House Democrats held a news conference outside of Greitens’ office asking him to veto legislation that would make it harder for people to successfully sue for employment discrimination. Republican Sen. Gary Romine's bill, which passed Monday, has been a key priority for business groups who contend Missouri's legal climate makes it too easy to sue. But Democrats like state Rep. Crystal Quade, D-Springfield, said Romine's legislation rolls back crucial civil rights protections. Democratic Rep. Crystal Quade of Springfield (center) speaks at a news conference Wednesday held by House Democrats about the workplace discrimination bill. She and other Democrats also criticized Romine for filing the bill after his rent-to-own business was sued for racial discrimination. Romine said his bill would not affect that lawsuit. "The people in my district that went in [Greitens'] favor were very excited about the possibility of a governor who would stand with the people against corruption and against self-dealing legislation," Quade said. "For me personally, that's the governor I'm looking for." Some of them were so incensed by the bill that they didn't participate in Monday's vote. Rep. Bruce Franks of St. Louis was among them. "One of the main reasons we didn't vote is that we shouldn't even have to vote on this. This shouldn't even be legislation. ... We have a lot of people that are so pro-business that they forget the fact that we're here to be pro-people," he said. The Democrats also delivered letters asking for Greitens to veto the bill. The governor, who spent part of Tuesday evening talking with lawmakers near the House chambers, hasn’t said whether he will sign the measure. The Senate gave the final signoff on creating a task force to look at how to better fund the state’s interstates and major highways. It has free reign to find solutions, but will be chaired by Republican Sen. Bill Eigel of St. Charles, who is no fan of raising the state’s fuel tax. He also opposes the idea of turning Interstate 70 into a toll road. Also, supporters of a tax to help fund the St. Louis Zoo are renewing their efforts to get it to Greitens. The House amended a bill about road districts and wastewater systems to include the same bill it passed last month, allowing voters in St. Louis city and St. Louis County to authorize a sales tax to fund infrastructure needs at the century-old zoo. The amended bill now goes to the Senate. Wednesday was Seersucker Day in the Missouri Capitol. The Missouri House held a moment of silence Wednesday morning for the cousin of Rep. Cora Faith Walker, a St. Louis Democrat. Walker noted during debate on the prescription drug monitoring bill on Tuesday that her 31-year-old cousin, a mother of two, took a fentanyl pill (an opioid) for a toothache in lieu of getting to the dentist and had been on life support. The woman died overnight. Republican Rep. Robert Cornejo of St. Peters announced well ahead of the 2019 legislative session that he'll be running for Speaker of the House. Senators dined on fried fish and hush puppies in the evening, courtesy of Republican Sen. Dave Schatz of Sullivan. The fish fry spread awaits Missouri senators on Wednesday night. The House called it quits before 8 p.m., and the Senate finished just after 10 p.m. The bill to establish the last-in-the-nation statewide prescription drug monitoring program gained new life when the main House sponsor agreed to accept the Senate’s changes, but a vote was tabled late in the evening because of opposition to those very changes. Meanwhile, the Senate approved an amended bill to adhere to the federal ID law early Wednesday morning, but it still needs to pass in the House before going to Greitens. Krissy Lane contributed to this report.